After weeks of weird poster teasing, Riot Games has officially revealed League of Legends’ newest champion—the rider and mount duo Kled. 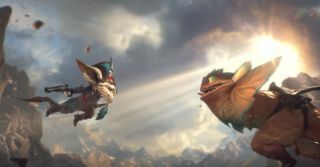 The announcement was made during the EU LCS stream—following the week eight, day one game between Fnatic and Splyce—where a teaser trailer showed the one-eyed, beard-sporting, pirate hat-donning Kled (who looks a wee bit like a cross between existing champions Ziggs and Gnar), as he’d reunited with his mount on the battlefield. Beyond that, details are thin on the ground for now, however it’s likely more will be revealed in the coming days. Until then, since we’re talking champions, why not read Cassandra Marshall’s thoughts on why the evolution of LoL’s roster bodes well for its future, or check out James Busby’s most underrated champions?